On your next trip to Lewisville, North Carolina, don’t hesitate to book this 5-bedroom, 3-bathroom vacation rental house that accommodates up to 14 travelers. Enjoy a game of pool at the private billiards table after shopping & dining in historic downtown Winston-Salem 20 minutes away. You’ll also be within a 20-minute drive of Wake Forest University Campus, along with Tanglewood Park for golfing, canoeing, and perusing the Rose Garden before enjoying the Festival of Lights! 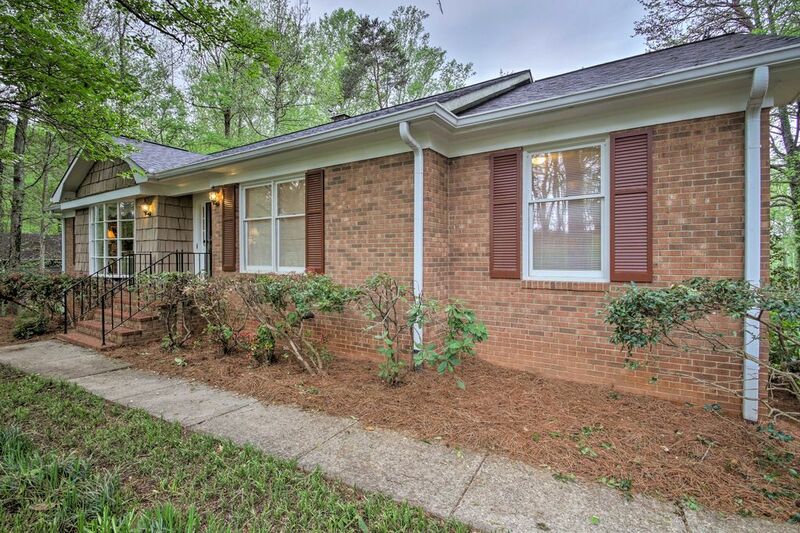 Nestled among the trees, this spacious ranch-style property is ready to be your home base in Forsyth County. With 3,000 square feet of living space, there’s plenty of room for everyone in the group to settle in comfortably! A formal living area welcomes you inside, and offers the perfect space to relax with a new book or discuss tomorrow’s agenda. Down the hall you’ll find the family room complete with a wood-burning fireplace and 55-inch flat-screen cable Smart TV. While the designated chef cooks up a feast in the fully equipped kitchen, others can head to the downstairs den to play a game of pool. Continue the interactive fun with a ping-pong match in the garage! You’ll be able to choose from 5 bedrooms for a sound night’s sleep. The king master suite features an en-suite bathroom with a shower/tub combo for those looking for additional luxury. If you’re in town for Wake Forest University’s graduation or admitted student’s day, this is the home for you! You’ll be just a 20-minute drive from the campus for effortless event access. The dynamic Tanglewood Park is also within a 20-minute drive of this home. Golfers can choose between Oak Valley or Tanglewood Golf Club before enjoying the Festival of Lights with family & friends. Brimming with historic charm, downtown Winston-Salem is ready to entertain travelers of all ages. Marvel at NASCAR speed racers and vintage rides at the Winston Cup Museum before indulging in good eats in the North Historic District. Perfect accommodations for our family weekend. Lots of space and amenities for our party of 8. The pool table was great entertainment for the rainy weekend. Well stocked with supplies, too! The home was welcoming and the guidebook helped us with the details. Our stay was very comfortable and allowed us to have a wonderful family trip. Eight members of our family just spent 5 great days at this lovely home in Lewisville, NC, enjoying views of the pond behind the wooded lot, playing billiards, ping pong, and corn hole -- all available at the house -- and just hanging out. The beds were clean and comfortable, the rooms were spacious, and the kitchen had all the dishes, glasses, cups, pots, pans, and utensils we needed for our meals. We'll definitely go back if we need family space in the Winston-Salem area. The house was awesome and it’s located in a very quiet neighborhood. There were 13 of us and it handled us very nicely. Even though it may be considered an older rental, the layout was good for a group of 3 couples. The fireplace was available for those cold nights we stayed in.